In this well-written memoir, Eric 'Timber' Woods recalls his flying experiences with 106 Squadron, flying from RAF Finnigley near Doncaster and 144 and 61 Squadrons, both flying from Hemswell in Lincolnshire, as a navigator of a twin-engined Handley-Page Hampden bomber during 1940/41. Eric's recollections give an informative first-hand perspective on the early years of RAF Bomber Command and of the particular challenges that faced the crews of the relatively small twin-engined bomber aircraft in use at the time. These aircraft, although remembered with affection by those who flew them, lacked speed and manoeuvrability and suffered heavy losses. 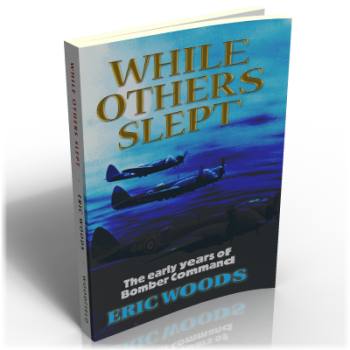 Eric tells of his numerous sorties over enemy-occupied Europe and of many 'close shaves', including a disastrous crash landing in the UK with the aircraft's bomb-load still aboard, which he and his fellow crew miraculously survived. Although he suffered severe injuries which led to hospitalisation, he resumed flying duties and completed his 'tour' of 31 operational missions over enemy territory. He subsequently transferred to RAF Transport Command for the remaining years of the war. At all times modest and unexaggerated, this is an exemplary account of wartime flying which is highly recommended to historians and aviation enthusiasts, or indeed, anyone who enjoys a real-life adventure story.